Remember the glowing fun of black lights? At the roller-skating rink or a concert by your favorite band, almost everyone is familiar with black lights and how they make certain materials come alive with fantastic glowing colors--whether it's fuzzy black posters with highlighter-bright Grateful Dead bears and peace symbols or a range of fluorescent beads with a lemon-lime tint. 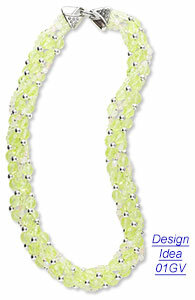 Yep--you can capture this terrific trend with fluorescing glass beads. Popular since the 1830s, they're created from a specific formula of glass which can be transparent, translucent or opaque. It became known as vaseline glass in the 1920s because its glossy transparent appearance is similar to Vaseline® petroleum jelly. Vaseline glass typically has a yellow-green hue in daylight and looks bright, bold fluorescent green under black light. The glow-y appearance of vaseline glass comes from uranium oxide diuranate and additional fluorescing colorants such as manganese and iron infused into the glass at the molten stage. Vaseline glass is not harmful--you are exposed to more radiation from nature walking around out-of-doors than you could get from the glass! American production of vaseline glass ceased during World War II because the US government confiscated all supplies of oxide diuranate to supply war efforts, with production resuming in the 1950s. Today, only a small amount of vaseline glass is produced in the USA and the Czech Republic. Vaseline glass is found in some colored Czech glass beads, including jonquil yellow, lemon yellow, yellow/blue and black/green tortoise. In natural light, they have a bright, almost neon appearance. Under a black light (UV) lamp, they glow a strong green. Vintage vaseline glass beads have become very collectible. Since they are rare, they can be quite expensive. However, the colored Czech glass beads mentioned above are known to glow even brighter and are more easily available and affordable than the vintage varieties. Create jewelry with a dual personality, known for its beauty under sunlight--and its surprising fluorescent magic by black light! It's a great complement to this season's bright, neon colors. 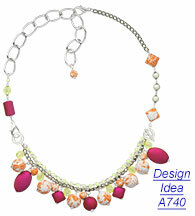 Be the life of the party this season with an attention-getting entrance in fluorescing jewelry!